I’m really not a huge fan of authentic Italian food. I don’t like lasagna. I don’t like carbonara. I don’t care for the white heavy cream based sauces that can be found in a lot of Italian dishes at all. I’m not one for using lemon in savory applications. I’m actually not even a huge fan of cheese in general. If it weren’t for pizza, I could probably live without eating it entirely. My love for Italian food can basically be summed up in a plate of pasta (preferably spaghetti, rotini or ziti) and a mess of meaty marinara sauce dumped on top of it. If I’m feeling really “adventurous” there’ll be Parmesan cheese sprinkled on top. Everything else I’m probably going to want to pass on. All of the above is what makes today’s recipe somewhat special. I count it as me daring to be ‘adventurous’ and cook then eat something Italian that isn’t just pasta and meat sauce. I needed to cook something that would last for the week but I didn’t really know what. I looked through the sale ads and didn’t seem any meat that was on sale except for pork chops and pork loin (neither of which I really felt like cooking or eating). So then, I went digging through my freezer to see if I’d bought any meat a while back then saved for later and just forgot about it. Turns out, I had. I found two packs of chicken cutlets (chicken that’s thinly sliced and/or pounded thin by the butcher ahead of time). Most times meat that’s been prepared into cutlets is for the purpose of sandwich making. The protein is thinner, so it cooks relatively quickly and can fit on pieces of bread without much hassle. 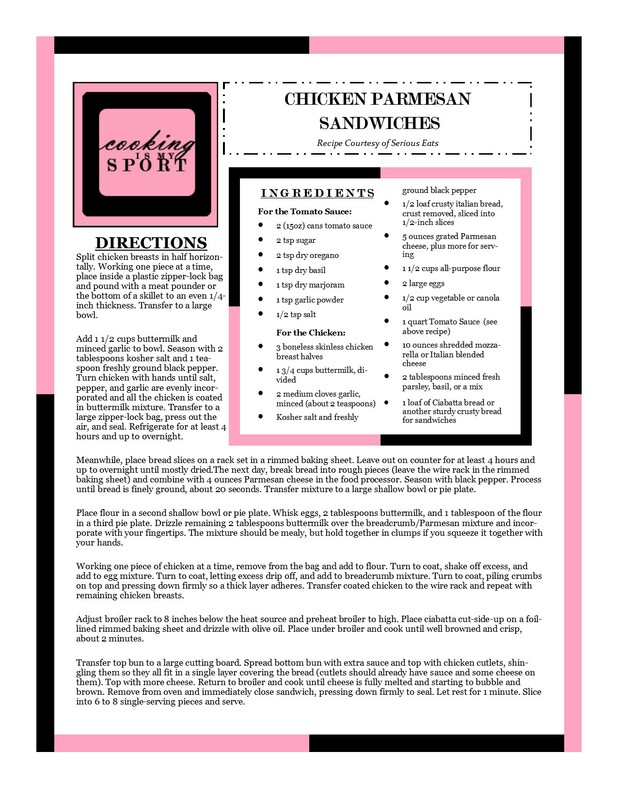 I’ve already made chicken schnitzel before on the blog with great results, but I wanted to make something new that I could post and share. I’d also made shredded chicken into tacos just a couple weeks ago, so using the cutlets for that for that seemed kinda redundant. As a cook and eater with Southern roots, I’m of the opinion that it’s pretty tough to go wrong with chicken that you bread and fry, no matter what cuisine we’re talking about. Then, because a good red sauce is one part of Italian food that I like, I figured throwing them together couldn’t result in too shabby a meal. It also wouldn’t take a very long time to make, So for all those reasons, I decided to go ahead and make Chicken Parmesan for the first time, ever. I really, REALLY liked the results. The best marinara sauce I’ve had to date is the one I made for my Pizza Hut-style breadsticks and Pan-Pizza that I made a while back on the blog, so that’s what I decided I would use for this recipe. I did a double batch because I love my sauce and wanted to have plenty to eat during the week for leftovers, but you can always cut it in half if you’re a less is more kind of a person. Anytime you let chicken soak in an overnight buttermilk bath, you know that you’re going to have chicken that cooks up very moist and tender. I let mine chill for the whole 24, and once again I proved to myself that chicken breast haters are just doing their chicken breast wrong in how they treat it. The cutlets came out VERY moist and juicy on the inside. Chicken breading can sometimes run the risk of being bland and tasteless, but the method of including cheese with the actual breadcrumbs that the chicken is fried in gives it a GREAT flavor and texture. The crust came out perfectly crisp and golden when fresh and even when reheating the leftovers throughout the week, I found that I liked it even after it had gone soft. If you’re not a fan of Ciabatta bread, or you can’t find a grocery store or bakery in your area that carries it, that’s totally fine. Pepperidge Farm bread slices have also worked for me. I will say though, that for these sandwiches you want to use a bread that when toasted is big and sturdy enough to support the weight of the hot chicken and won’t get flat and soggy when you pile on the cheese and warm sauce. So please don’t sell yourself short; go for the good stuff. The verdict is in and…Chicken Parmesan can sit with us. Finis. Happy Fiesta Friday #132, co-hosted this week by Sandhya @ Indfused and Nancy @ Feasting With Friends. Split chicken breasts in half horizontally. Working one piece at a time, place inside a plastic zipper-lock bag and pound with a meat pounder or the bottom of a skillet to an even 1/4-inch thickness. Transfer to a large bowl. Add 1 1/2 cups buttermilk and minced garlic to bowl. Season with 2 tablespoons kosher salt and 1 teaspoon freshly ground black pepper. Turn chicken with hands until salt, pepper, and garlic are evenly incorporated and all the chicken is coated in buttermilk mixture. Transfer to a large zipper-lock bag, press out the air, and seal. Refrigerate for at least 4 hours and up to overnight. Meanwhile, place bread slices on a rack set in a rimmed baking sheet. Leave out on counter for at least 4 hours and up to overnight until mostly dried.The next day, break bread into rough pieces (leave the wire rack in the rimmed baking sheet) and combine with 4 ounces Parmesan cheese in the food processor. Season with black pepper. Process until bread is finely ground, about 20 seconds. Transfer mixture to a large shallow bowl or pie plate. Adjust broiler rack to 8 inches below the heat source and preheat broiler to high. Place ciabatta cut-side-up on a foil-lined rimmed baking sheet and drizzle with olive oil. Place under broiler and cook until well browned and crisp, about 2 minutes. Transfer top bun to a large cutting board. Spread bottom bun with extra sauce and top with chicken cutlets, shingling them so they all fit in a single layer covering the bread (cutlets should already have sauce and some cheese on them). Top with more cheese. Return to broiler and cook until cheese is fully melted and starting to bubble and brown. Remove from oven and immediately close sandwich, pressing down firmly to seal. Let rest for 1 minute. Slice into 6 to 8 single-serving pieces and serve. Well Jess you picked a favorite of mine to focus on, love chicken parm whether in a sandwich or with pasta. It looks so good, I almost want to cook so I can dig in. Delicious!! You’ve got me chucking Jess! For someone that does’t particularly like Italian food, you make a mean looking chicken parmesan! Love the idea of soaking the cutlets in buttermilk, I’ve never done this before! What no lasagne no cheese? Are you from earth? hahaha. I love it all, and this sandwich looks delicious Jess! One of my favorite sandwiches! These look delicious, Jess! This sandwich looks incredibly delicious in between those toasted bread slices with the melted cheese on top. Oh, la la! Yum! OK…that looks like pure heaven with an extra dose of heavenly heaven on top. This was my first time making and eating it, and I’m glad to say that I now love it too; thank you! Reblogged this on Day Night Cook.